Really? Attacking a Candidate for the Passage of Things He Fought Against? Is Don Wagner the “Pro Life” candidate? Enter your email address to subscribe to OC Political and receive notifications of new posts by email. ORANGE COUNTY, CA – Orange Treasurer Eric Woolery announced today that he has locked up the major county election mail slates in his campaign for Auditor-Controller, which will carry his message to voters on 1.5 million pieces of mail. Based on prior election results for Auditor-Controller and current voter turnout models, nearly 350,000 voters are expected to cast their ballots in this election for Auditor-Controller. Securing the slates will ensure that Woolery’s message will be heard by every high propensity voter several times before the June 3 election. Paid for by Woolery for Auditor-Controller 2014. ID# 1362822. (ORANGE COUNTY, CA) – Orange Treasurer Eric Woolery has announced his candidacy for Orange County Auditor‑Controller. He enters the race as the clear frontrunner, with $50,000 cash on hand and a lengthy list of bipartisan endorsements from across Orange County. In addition to his current elected office of Orange Treasurer, Woolery’s public service began with his election to the Orange County Board of Education and continued on the Orange Audit Committee and as Deputy Director of Administration in the Riverside County District Attorney’s Office. He spent the majority of his career in the private sector, having served as the owner of a multi-location private accounting firm, a corporate CFO, a corporate controller, and an accountant. A Certified Public Accountant (CPA), Woolery earned his Bachelor of Arts in Business Administration and Accounting from Cal State Fullerton. He resides in Orange with his wife, Lisa, and their two young children. I’m live at the RSCCD Board meeting to cover Item 6.6 on their agenda. For background on this item, see my post earlier tonight on this. Basically, the RSCCD Board was discussing in closed session efforts to impose a PLA on all work done from Measure Q, the $198,000,000 bond passed in 2012 in the western half of the district (Santa Ana and very small portions of Garden Grove and Anaheim). Item 6.6 forces the PLA to be discussed in open session. (5:42 PM): Trustee Claudia Alvarez says RSCCD wants to follow the law. She says many districts negotiate PLAs in closed session. She says the reason to negotiate a PLA in closed session is for the district’s strategic advantage. She says there is no cover-up effort because they’ve brought Item 6.6 in open session. (5:43 PM): Trustee John Hanna says these PLA negotiations should no longer be discussed substantively in closed session. Hanna says he agrees with Alvarez. He says the Chancellor should negotiate privately, so the RSCCD Board can examine the negotiation product in open session. (5:46 PM): Trustee Larry Labrado wants the Board Executive Committee (not just the Board President) to be able to privately confer with the Chancellor on the PLA. The Executive Committee consists of 3 of the 7 trustees: the President, Vice President, and Secretary. (5:47 PM): Alvarez says there’s nothing wrong with each trustee being updated by the Chancellor on the PLA negotiations. (5:48 PM): Hanna wants Item 6.6 to be amended to have Board to “continue its practice of refraining” from discussing the PLA negotiations. (5:49 PM): Trustee Phil Yarbrough disputes that this is RSCCD’s practice, hence the need for Item 6.6. (5:50 PM): Hanna says it is the practice. He hopes to get an Attorney General opinion that they can negotiate PLAs in closed session. (5:52 PM): Yarbrough says amending the practice going forth like Item 6.6 is good because PLAs should be discussed in open session like the Brown Act requires. (5:53 PM): Chancellor Raul Rodriguez warns that the Alvarez proposal could violate the Brown Act’s serial meeting rules. (5:54 PM): Board President Arianna Barrios says there are four conflicting opinions, including the Chancellor’s and Craig Alexander’s. She is concerned that RSCCD would lose in an Attorney General’s opinion, so that’s one of the reasons she agendized Item 6.6. (5:56 PM): The Hanna Amendment is passed unanimously. (5:57 PM): I note that neither Trustee Jose Solorio nor Nelida Yanez has uttered a word in the debate. (5:58 PM): Item 6.6 is approved unanimously. (5:59 PM): Hanna says he will nominate Alvarez for Clerk. Yarbrough seconds. Labrado says he would like to be Vice President. (6:15 PM): I’m done with this live blog. It’ll be interesting going forward in future meetings, with their pledge to not discuss PLA negotiations in private. 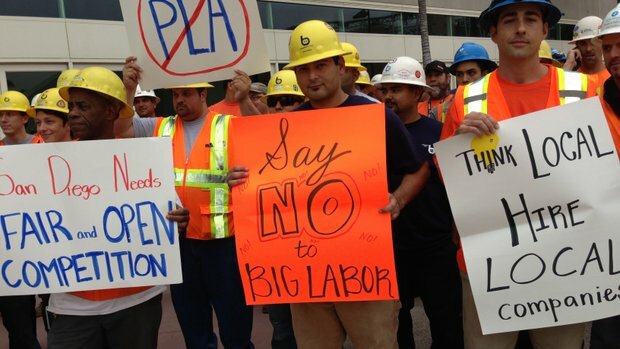 We’ll be keeping a close eye on the developments with the PLA, which will mandate only unionized labor working on Measure Q projects. The other union demands will also be included in the PLA, but obviously those are still being negotiated; OC Political will reveal those as soon as we know what they are. RSCCD President-designate Solorio will likely have his hands full when the PLA terms go public. Conservative Trustee Phil Yarbrough has accused the liberal-dominated RSCCD Board of violating the Brown Act by negoiating PLAs in closed session. Yarbrough has retained attorney Craig Alexander (an affiliate attorney of the Pacific Justice Institute and an OC Political blogger), who sent this seven-page letter admonishing the district and demanding it comply with the Brown Act, the state’s government transparency law, by discussing the PLA in open session in front of the public. In an apparent reaction to the letter, the RSCCD agenda for tonight’s meeting includes Item 6.6, which is entitled, “Discussion of Community and Student Workforce Project Agreement Negotiations with Los Angeles-Orange County Building and Construction Trades Council/Craft Unions/Carpenters Union” on the agenda. (“Community and Student Workforce Project Agreement Negotiations” is the RSCCD euphemism for “PLA negotiations”). The staff recommendation is: “It is recommended that the board formally agree to refrain from any discussion of negotiations on the Community and Student Workforce Project Agreement in closed session unless or until more conclusive information is provided to clarify the legality of such discussions in closed session per the Brown Act.” In other words, the RSCCD is no longer certain that its previous actions in discussing the PLA negotiations were legal. Kevin Dayton has dissected the RSCCD PLA issue at the Flash Report. Help stop RSCCD Trustee Jose Solorio from illegally hiding his $29 million taxpayer give-away to special interests! It is being voted on TOMORROW, TUESDAY 11/12/2013 at 4pm. It seems the Rancho Santiago Community College District (RSCCD) Board of Trustees has been violating California’s open meeting laws (also known as “The Brown Act”) by negotiating a discriminatory union agreement on their nearly $200 million dollar Measure Q bond passed by voters in November 2012. No mention of this wasteful special interest deal was of course ever made when selling this to the citizens – and now the public is being purposefully kept out of the debate. If that isn’t bad enough, they might vote tomorrow night to CONTINUE ILLEGALLY HIDING THIS FROM THE PUBLIC! Attend the meeting tomorrow. TUESDAY November 12th at 4:00pm at the RSCCD District Offices located at 2323 North Broadway, Board Room #107 Santa Ana, CA 92706. We need you to bring management, workers, and apprentices and tell the RSCCD Trustees to bring this deal out into the light of day! These discriminatory union deals are traditionally called Project Labor Agreements or PLA’s, but in another effort to disguise this waste from the public, RSCCD went so far as to call the agreement a “Community and Student Workforce Project Agreement.” Join us tomorrow night and help stop this ongoing deception! If it is such a good idea to waste $29 million dollars of our teachers and students education dollars just to over-pay for construction, then why is Jose Solorio trying to cover this deal up? I was working on a database of the part affiliation of all Orange County local elected officials. Finally, I have completed the project with all of the special districts and county seats being added. I also fixed some errors in the previous versions (here, here, and here) and have combined the database into one post. We have added a button on the menu bar for our readers to always be able to access this database and use it for whatever research/political needs that they may have. Due to the length of th epost you are going to have to click the below link to read the rest of the post. As promised, I have now put together a database for the School Board members and their party affiliation based on who will be serving post election. Based on results in a couple of races being close, this list may change before it goes up on the website permanently. If anybody reading this finds an error (like the situation where I thought Wendy Leece ran unopposed for NMUSD) please let me know so I can fix it. The candidate filing period has closed, and there are two unopposed candidates for Rancho Santiago Community College District. Assemblyman Jose Solorio (D-Santa Ana) is unopposed in his bid for Trustee Area 1 (candidate filing will not be extended there as the area has no eligible incumbent) while Appointed Rancho Santiago Community College District Trustee Arianna Barrios (NPP-Orange) will be unopposed for her bid for a full term in Area 7. Greta Rice (D-Orange) had pulled papers to run against Barrios but did not return them by the close of filing. No one pulled papers against Solorio at any time. Neither race will appear on the ballot since there’s only one candidate (unless 50 voters of the respective trustee areas file a petition demanding an election with only one candidate on the ballot).